Hay Hay! Vote for Donna Day! It’s good to have friends. See…in case you didn’t know, Running With Tweezers has a Myspace. One of my newest friends is Drew, who roasts some amazing coffees as Drew’s Brews. As a coffee fan…and girlfriend to a rabid coffee drinker and best friend to some serious fans…getting to know Drew and his coffee seemed like a good idea. He was sweet enough to send me some samples and I’ve become hooked. I’ve ordered several kinds & shared some with friends..and each type has been incredible – I’m still hooked on Lost Weekend. When the boy and I booked our mountain house for vacation, we were informed that there was an ice cream maker on the premises. We practically squealed (well *I* did, at least). Ice cream is a big treat for me…and sounded like the perfect project to splurge on during vacation. It all seemed to come together perfectly – merging our loves of coffee, ice cream, and cooking. The rumblings began weeks before we left and I came prepared with a copy of David Lebovitz’s Coffee Ice Cream recipe, which I found a copy of on Elise’s Simply Recipes. Sure enough, on a Friday evening, I was out on the patio…enjoying the view and chatting with a friend on the phone. I see, out of the corner of my eye,a flurry of activity in the kitchen. The boy had taken the kitchen by storm and had started prepping the ingredients for coffee ice cream…with chocolate covered espresso beans in it. An hour or so later, we were enjoying the creamiest, most heavenly textured ice cream I think I’ve ever had. The crunchy, dark coffee beans were such a great contrast to the rich ice cream. Add them in after the liquid has cooled & before it all goes in the ice cream maker…and make sure you don’t this *right* before bed! let steep at room temperature for 1 hour. vanilla and finely ground coffee, and stir until cool. it in your ice cream maker according to the manufacturer’s instructions. Even though it is cool here…I would love a scoop of that! Mmmm ….. buono! It is not exactly icecream weather here as well … but I wouldn’t mimd a double scoop! Oh this looks so good, I haven’t tried this recipe from his book yet – but the ones I have tried.. yum! Wow. This looks unbelievably yummy. All I need with it is a sugar cone! I didn’t even have to read the article…you had me at the picture! What a yummy sounding recipe. I’ll definitely have to whip out the old ice cream maker and give this a try. Thanks! 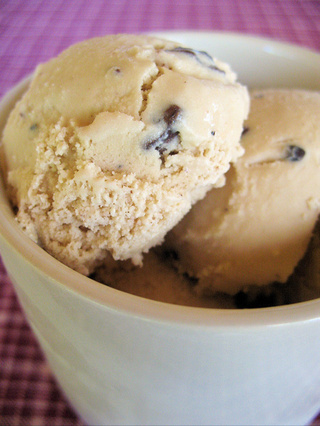 Coffee ice cream is my favorite. Can’t wait to try this.